After the final discovery of a photo that included the residence of my Alvarado ancestors’ house from 1900s and 1920s Los Angeles tucked away in a neighborhood, I thought that was about as good a find as I could get. So imagine my surprise when I stumbled upon a close-up image of the very house my great-grandparents lived in when they first arrived in Los Angeles in 1899. I had occasionally skimmed through collections of old images of Sonora Town, the area around the Plaza Church where José María and Jesús Alvarado first landed in the city. I was always on the lookout for that house with a long staircase set at an angle at the southeast corner of North Broadway and Bellevue Avenue (which became Sunset Boulevard in 1912 and today is Cesar Chavez Avenue). I had a schematic of the house at 412-414 Bellevue from a 1900 Sanborn Map, so I knew its basic size, shape and position. So imagine my surprise when a look through the USC Digital Library revealed an amazing close-up of that very house. 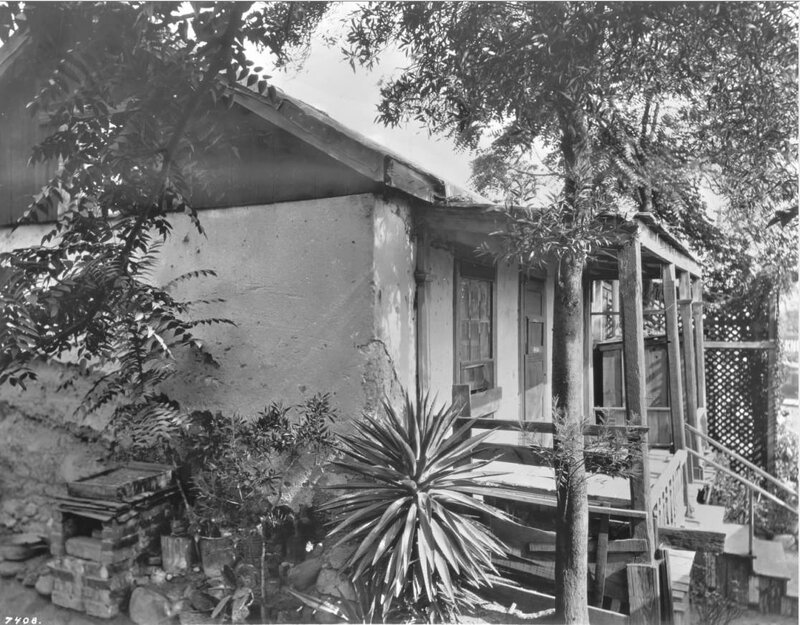 Photograph of the exterior of an adobe built by Francisco Manza at 412 Sunset Boulevard, Los Angeles, ca.1925. The adobe, built in 1865, is pictured here from the side; a small brick kiln and a collection of other yard items stands with a small palm tree alongside the house. Farther in, a door with a mail-slat and a six-paned sliding window are visible at the back of the raised porch, from which wooden stairs descend to the right. This has got to be one of the most exciting family history discoveries I’ve made, an actual glimpse into how my immigrant great-grandparents first experienced this city. amazing work eric, how long have you been working on this? did you say our grandma consuello lived in that house? Hey Donn, this is my Alvarado ancestors, on my mother’s side. I found your families house doing family history. I am trying to find every house that my grandfather and Dad lived in. My Grandfather and Dad rented and lived at 418 1/2 Sunset blvd, Dad was 19 at the time. The house is next to 412 1/2 shown on your photo. A more complete view of this house and where my dad lived at in 1930 is show in skyscraper forum http://forum.skyscraperpage.com/showthread.php?t=170279&page=581. This same guy in skyscraper found another view of the cluster of houses there and misidentified it as 412 but it is actually 414 sunset also built by your family. Check it out. I use a later date from Sanborn maps. If you have a library card from the City of los Angeles (not county) you can go on line at there . If you are a resident of California you can get a card for free otherwise it 65 dollars for non residents of California. Anthony, thanks for this. I just went to that post on the skyscraper forum and it’s awesome! Hi Anthony, This is very interesting! Thanks for sharing this discovery! Comparing the photo you identified, I’m interested to know your answer to a couple of things. The back of the house to me looks different from the photo identified in Noirish LA ( http://forum.skyscraperpage.com/showpost.php?p=5976854&postcount=11618 ). The gables look like they go a different direction, and from this angle the house appears to be wooden rather than adobe. And wasn’t the Manza adobe on the southeast corner (if I recall correctly)? This house looks like it’s above the Colima building at the northwest corner. What do you think? Okay your Sandborn map list “avenue” on top- that should be sunset blvd . The photo you posted is for house number 414 1/2 not 412. The view to left of that house is 418 . Your photo is the view from the back yard looking toward sunset Blvd., This is the same photo as 1st shown on skycraperpage. 2nd skycraperpage photo-This photo is again of the view of the backyard. The house on the left side is 418 1/2. Your Sandborn map shows only 418. 418 1/2 was added later in plane with 418 it makes it look like a longer house but with a breaker in between. So now there are 5 houses instead of 4. 3 along Sunset Blvd. and two behind them. 3rd skyscraper page photo-he is right the picture should be flipped horizontally. This is the view of the front of two of the houses along sunset Blvd. 4th photo (flipped)- the first house to the left is 412 the one on the right is 414 with a lean to shied attached to the right side, the third house 418 should be more to the right of photo has not been built yet. Your house from your photo sets behind 414 the house on the right. He mistakenly thinks that house is the opposite side of the 1st photo. It is not- but he actually got that number correct- it is 412. From aerial photos- The next thing that happen is the café turn the houses into a parking lot for them. A standard gas station also appear there next. Then The Broadway tunnel was dug up, hill and all. That’s when the gas station was gone- nothing was there. But the Comina café is there now. Maybe the architect made it look like the former restaurant building. that’s another puzzle left for others to figure out. 5th photo-this is the view of the north side of the Broadway Tunnel. the right side of the view of the tunnel is a Building (ROMA Café). Further right from this building (Roma Cafe) out of the photo is where the houses are along sunset Blvd on a slight raise of the hill but only a few feet from Sunset blvd. The guy from skycraperpage claimed that the all the houses were abode with wooden board b put on some of them. That is why the Abode is not visible from on some of the other houses. I think like you do the house 412 and 4141/2 are abode the other house are wood construction. I recently got some negatives of my family that I believe were taken at the 412 Sunset location. 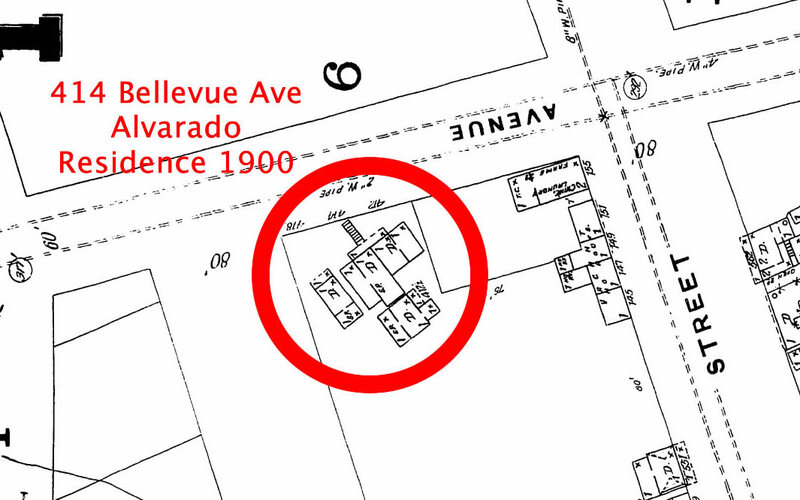 The 1930 census showed my family living at 418 Sunset- That is why I waschecking this location so much. again. After I checked some more. Those bunch of houses change numbers back and forth over the years. and one of the house is even listed in the 1930 census as 510. I looked at some more photos of that location and other houses were added and removed. all the details of these house changed too over so many years. So I hope I answered your question. I believed you got the right photo of the house that your great grandfather lived in. I also got my grandfather’s and father’s house right too. I too think it is amazing that these photos even exist. What a great find. The guy from skyscraper is right-412 sunset is next to the Colima building.This house is just above the Colima building at the northwest corner- the base of the house is at the same level of the roof of Colima. You are right again- the skyline would not be visible from the back of the house because the hill is in the way. I am done with this project. Thank you for your replies. You are a pro, Anthony! I’ll keep you in mind if I ever need a sleuth.